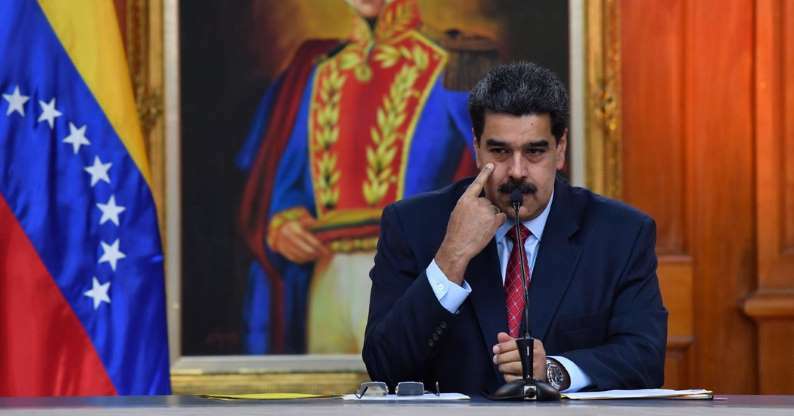 The video, posted on his social media accounts, came out on the same day Mr. Maduro gave an interview to Russia’s RIA news agency in which he seemed more conciliatory, saying he was open to talks with the country’s opposition but rejecting calls for a new election. “I am ready to sit down at the negotiating table with the opposition,” Mr. Maduro said, naming Mexico, Uruguay, Bolivia and Russia among possible mediators, but giving no indication of having made progress in arranging the talks. The United States last week recognized Venezuela’s opposition leader, Juan Guaidó, as the country’s acting president, as have 26 other countries. Many thousands of Venezuelans poured into the streets last week and again this week in anti-government protests called by Mr. Guaidó. Mismanagement and corruption under Mr. Maduro has plunged Venezuela, an oil-rich country that was once the wealthiest in Latin America, into a humanitarian crisis. Many of its citizens are going hungry and sick, and more than three million have fled abroad. As part of a push to oust Mr. Maduro, the Trump administration has imposed sanctions that cut off his government’s access to the revenue from oil sales in the United States, one of Venezuela’s main sources of cash, and seeks to make it available to Mr. Guaidó instead. A presidential election last year returned Mr. Maduro to office for a second six-year term, but it was marred by widespread reports of fraud and coercion. Several European Union countries have called for new elections — a prospect even the opposition says will take some time — and have warned that they will recognize the opposition leader if Mr. Maduro does not schedule a new vote. China and Russia have continued to support Mr. Maduro, as have Cuba and Bolivia. President Trump seized on Mr. Maduro’s offer for talks with the opposition by suggesting on Twitter that the Venezuelan leader had acted in response to American sanctions. Mr. Guaidó said on Twitter that Mr. Trump had telephoned him to reiterate American support and pledge humanitarian help. He said the opposition was focused on large-scale demonstrations scheduled for Saturday. The government has tried to impede reporters covering the protests. On Tuesday, security forces detained a number of journalists covering demonstrations outside the presidential palace in Caracas. Two French journalists were still being held on Wednesday and two Chilean journalists were deported, according to the national press union. Two Venezuelan journalists were detained and later released. Mr. Maduro also dismissed the possibility of military intervention by the United States to remove him from power, a prospect raised by John R. Bolton, the national security adviser. He called Mr. Bolton “infantile” and “clowning” for speaking to reporters while holding a notepad with the phrase “5,000 troops to Colombia” written on top. He took a blunter tone in a video posted on his Facebook and Twitter accounts. The opposition has been meeting with midlevel officers to discuss amnesty for defectors, a prominent opposition member told The Times last week. Mr. Guaidó also called for international backing while he takes steps to set up a functioning government. “I have appealed to António Guterres, the United Nations secretary general, as well as to several humanitarian agencies, for support in easing the humanitarian crisis,” he wrote. Mr. Guaidó’s envoy to the United States, Carlos Vecchio, said in Washington on Wednesday that he was starting the complex process of securing Venezuelan government assets held in bank accounts in the United States. He said he was meeting with White House and Treasury officials this week. Elliott Abrams, the new United States special envoy for Venezuela, told reporters that American officials and Mr. Guaidó were looking around the globe for assets belonging to the Venezuelan government. Where possible, he said, the United States will ask countries to freeze the assets to keep Mr. Maduro’s government from accessing them, he said. Ana Vanessa Herrero reported from Caracas, and Austin Ramzy from Hong Kong. Christopher F. Schuetze contributed reporting from Berlin, Edward Wong from Washington, and Megan Specia from New York.